Cool Weather is Around the Corner! There are several ways to prepare your plants to protect them from cold. Water the soil thoroughly before the cold front moves through the area. Moist soil holds more heat than dry soil. Wrap the trunk of grafted trees with twelve to fourteen layers of newspaper, tie it at the top and bottom. If tender shrubs are small place cardboard boxes over them and if the shrubs are large, place several stakes and then toss your cover over your shrubs. Adding a light bulb source or Christmas lights left on all night, will increase the protection of your plants. A one hundred watt bulb will give off a lot of heat and the box or the cover will retain the heat. Place the light bulb on rocks or bricks to prevent a fire. Place something heavy on the box to keep it tightly to the ground. Your cover should be cloth. DO NOT USE PLASTIC as it will cause the inside of the cover to lose radiated heat – therefore it super cools the plant and becomes colder than the outside. Make sure to turn off your irrigation system so you won’t have ice when it turns very cold at sunrise. But when it warms up to 40 degrees without wind, then turn on your water to get the heat back in the ground if we have a freeze for that night. Come in and ask for our “COLD DAMAGE GARDENING TIPS” brochure for more information on what you need to do after we have had a freeze. Prepare your bedding plants and fall vegetables now! It can be very rewarding if it is properly done. Here are some important things to keep in mind when choosing the proper place for your vegetables and flowers. Find a full sun location, if trees or shrubs are too close, your garden will be shaded out and not bloom or bear fruit. Soil must be level and well drained, vegetables and flowers will not grow in standing water. Root rot will set in. Must be able to have water or irrigation. Pick a spot that is easy to get to, near your house. Keep the garden free of trash, roots and such materials that will make it difficult to work. Plant the vegetables that you and your family like, do not plant too much of any one vegetable at one time as this makes for a feast and a famine. Plant flowers you can enjoy, by watching butterflies or useful for cut flowers in the home for color. Be sure you can grow the vegetable or flowers for this time of year or you will be disappointed. See section PLANT NOW. For vegetables or flowers prepare soil prior to planting by incorporating organic soil such as Peat Humus, Organic fertilizer such as cow manure, Garden – tone, Organic 6-6-6 or Milorganite. 8) Add Dolomitic Limestone if pH is too low. 9) For cutworms, mole crickets and other insects scatter the bait over the area such as Permethrin or Slug & Snail Bait. Camellias are beautiful flowers starting this time of year. Camellia sasanqua plants begin to flower in October thru January. These varieties are usually fast growing and very hardy to the cold and resistant to root rot. Camellia japonica plants begin to flower in November thru April. These varieties are usually slower growing and very hardy to the cold. Proper location in planting will save a lot of time in the future, by fertilizing, spraying and watering. 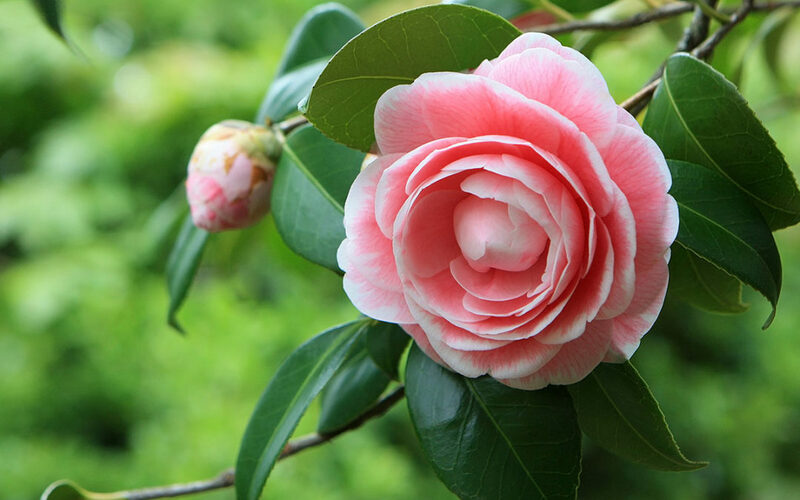 Select a partially shaded area, preferably north or eastside unless natural shade is available will be the best area to plant the camellias. Organic matter is a must in the hole when planting. Such as: peat humus, leaf mold, cow manure, Espoma Holly-Tone Fertilizer or Milorganite mixed with the existing soil. When you pay $10.00 to $25.00 for a specimen plant then set it in a hole valued at $1.00 the camellia doesn’t have much of a survival rate. Be sure to have some good air circulation or fungus and bugs will occur on the leaves. They like a well drained soil NOT wet or crown rot will set in. Fertilize your trees for the last time this year in November with CITRUS- TONE or CITRUS SPECIAL. Use 1# per foot of branch spread. Apply under and out to the branch spread of the tree and do not put against or next to the trunk. As cold weather approaches, protect young citrus with a REESE CITRUS INSULATOR. It protects the graft where the Citrus was budded so if it freezes it will come back originally and not a sour orange. They are very easy to install just clip it on any citrus tree. This protects the young trees 1/2 inch to over 3 inches in diameter for longer protection in those extra-cold locations. The insulator also discourages lower trunk sprouting and long-term insect control and weed-eater damage. Apply weed and feed now!!! It comes in two types – one for St. Augustine grass and another for Bahia grass. You must use the CORRECT ONE for your lawn. If you don’t you could damage your lawn or even kill your grass. The pre-emergent weed killers can still be applied to control grassy weeds such as crabgrass. If you have a mixture of St. Augustine and Bahia a pre-emergent can be used in both grasses because this insures that the weed seed doesn’t germinate. Re-apply every 90 days (12-16 weeks) and wait at least 30 days to interplant or over-seed your lawn with winter ryegrass. Nov/Dec. is the final application for Sedge Hammer Plus for Nutgrass in your yard for its control. Tis the season – when purchasing poinsettias, look for the yellow blooms in the middle of the colored bract, to make sure they are just beginning to open and haven’t dropped. Do not over water because poinsettias are in the cactus or succulent group of plants. They like the soil to be drier. If poinsettias are over-watered this will cause fungus and the leaves will drop. Avoid cold or hot drafts and dry air. Setting on a saucer of wet gravel improves the moderate humidity required. Do not wet the foliage, water at the bottom. They need protection from a freeze or frost. Plant poinsettias when danger of frost is over. Choose an area with FULL SUN during the day and away from exposure to light at night (no street light, porch lights or window lights). This time of year your roses should be beautiful, long stems and large blooms. Check for watering. November and December are very dry months. Dry cool air might dehydrate the leaves. Continue to fertilize once a month with ROSE – TONE by Espoma. December is the last month to fertilizer your roses. Check for pests and then spray them with BAYER 3 in 1 INSECT MITE & DISEASE CONTROL. Continue to pick up fallen and diseased leaves to control black spot. Winter is a good time to plant or transplant cold hardy trees and shrubs. They will grow best if moved in December through February. Root pruning them now, will help them survive the move. Small trees that are 1 1/2 – 2 inch trunk needs to be cut 12-15 inch circle around the plant, by slicing the roots with a shovel to a depth of 12 inches. The root-ball of the plant when it is eventually transplanted should be 4 inches beyond the root- pruned area. Increase the size of the circle if the trunk is bigger. Prepare the new location ahead of moving with Planting Soil, Milorganite and Hort-a-sorb. Keep the trees or shrubs watered well. Water them daily for the first month of transplanting, at least ½” inch. Wet the foliage to keep the leaves from dehydrating. For small plants, drive in stakes on either side of the plant to support it from high winds. If large trees use a tree staking kit so it will be more secure. Wrap the trunk with tree wrap to protect the outer layer so the rope won’t scratch the trunk. Fertilize for continual production of vegetables. Use TOMATO – TONE or BLOOM SPECIAL 2-10-10 for flowering vegetables and 100 % ORGANIC 6-6-6 for the leafy or root vegetables. Watch out for insects especially for cutworms and aphids. For control spray Permethrin or Sevin. Young plants like seedlings can get a fungus called damp-off. This kills the plant at the soil line. Weather is a big factor that you will encounter the fungus when it is wet, cold, rainy weather that retards the growth of the vegetable plant and makes them more susceptible to damping-off. For control of damping off use: NEUTRAL COPPER or DACONIL. Other fungi can attack this time of year is southern blight, downy mildew, anthracnose and bacterial diseases. Use NEUTRAL COPPER, DITHANE M-45 or DACONIL. BULBS: AMARYLLIS, CALLAS, IRIS, LILIES, LYCORIS, NARCISSUS, RANUNCULUS, STAR OF BETHLEHEM. ANNUALS (H=HARDY; T=TENDER): AGERATUM-T; ALYSSUM (SWEET)-H; BEGONIAS-T; CALENDULA(POT-MARIGOLD)-H; CLEOME(SPIDER FLOWER)-H; DELPHINIUM-H; DIANTHUS (SWEET WILLIAMS)-H; GAILLARDIA(BLANKET FLOWER)-H; GAZINNIA DAISY -H; GERBERA DAISY-H; GYPSOPHILLIA (BABYS BREATH)-H; HOLLYHOCK (ANNUAL)-H; IMPATIENS-T; LOBELIA-T; MELAMPODIUM-H; NASTURTIUM-T; NICOTIANA (FLOWERING TOBACCO)-H; PANSY-H; PETUNIAS-H; PHLOX-H; RUDBECKIA (BLACK-EYED SUSAN)-H; SALVIA (BLUE)-H; SALVIA (SCARLET SAGE)-T; SNAPDRAGON-H; STATICE-H; STOCK-H; SWEET PEAS-H; VERBENA-H; VIOLA(JOHNNYJUMPUPS)-H.
HERBS: BASIL -T; CATNIP-T; CHIVES; DILL; FENNEL-T; GARLIC; LAVENDER; MINTS-T; OREGANO; PARSLEY; ROSEMARY; SAGE; SWEET MARJORAM; TERRAGON; THYME. VEGETABLES (H=HARDY; T=TENDER): BROCCOLI-H; BRUSSELS SPROUTS-H; CABBAGE-H; CARROTS-H; CAULIFLOWER-H; CELERY-H; CHINESE CABBAGE-H; COLLARDS-H; ENDIVE-H; ESCAROLE-H; KALE-H; LETTUCE-H; MUSTARD-H; ONIONS-H; PEAS (ENGLISH)-H; POTATOES (IRISH)-H;RADISH-H; SPINACH-H; STRAWBERRIES-H; SWISS CHARD-H; TURNIPS -H.